RALEIGH – With no debate, the state Senate on Thursday overwhelmingly gave initial approval to a change in the state’s alcohol laws sought by small distilleries. The first floor vote was 40-8, and — if the measures prevails in its next vote, it will return to the House. The previous day the Senate Finance Committee backed an amendment by Sen. Rick Gunn, R-Alamance, to House Bill 909, a measure making a series of changes to other Alcoholic Beverage Control laws. Gunn’s amendment would allow small distilleries to sell a bottle of liquor, marked with a commemorative sticker, to customers touring the facility. Customers would be limited to one bottle of liquor per 12-month period and the distillery would have to maintain records of customers buying the liquor for 12 months. 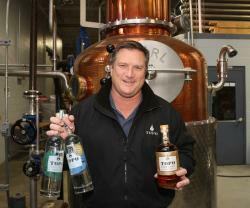 “I cannot tell you how much it means to North Carolina distilleries to be able to sell one item per person per year to visitors that come because we’re competing against some of the most well-funded companies in the world,” said Scott Maitland, proprietor at Top of the Hill Distillery in Chapel Hill, which produces TOPO beverages. He said it’s an important marketing tool to be able to sell directly to customers at the distillery. Maitland said the change also would create another revenue stream for the state because distilleries would pay excise and sales taxes on the commemorative bottles. Jon Carr, a lobbyist for the N.C. Association of ABC Boards, said the organization opposed the bill. Carr expressed concern at the precedent the move might set for the state’s alcoholic beverage control system. The change allowing distilleries to sell liquor is modeled after the changes that occurred in the late 1980s allowing small, craft North Carolina breweries to sell beer at their breweries. Maitland said that if the change becomes law, he expects to add more employees to his distillery. Barry Smith (@Barry_Smith) is an associate editor of Carolina Journal.